It seems too simple to be true, however, based on scientific research, we now know that your body language could change your career. We all hold our bodies and behave in certain ways depending on the situation we are in, the way in which we do so can tell a lot about us as people. We almost automatically know that certain gestures and poses, for example, would be frowned upon at an interview: leaning back in the chair, folding arms behind our heads, slouching on the table, curling up in the chair like we do at home on the couch; you would never! It is also not a coincidence that some of the most powerful people in the World hold their bodies in strong and powerful poses with open body language, exposing their chest and engaging hand gestures. Many, like Steve Jobs were trained in the skill of command and power speaking and are living proof that your body language could change your career. Displays of power and poses of power can also be seen very clearly in the animal kingdom, you may in fact notice that these poses reflect human body language of such power and submissive poses also. When we feel powerful, we stand tall, we use open gestures with our hands and arms and hold our chests open. When we feel subservient/ submissive, we cower into our body, wrapping it up, protecting it; we hold our arms close to our chest and even lower our head. When we feel powerful or want to display power we make our bodies bigger, in turn when we feel submissive or do not want to be noticed, we make ourselves smaller. The way we feel/ think affects our body language and so Amy Cuddy, of Ted Talks asks, what if our body language (and the ways we hold ourselves) could affect how we feel and think? Psychologically, we do not feel powerful enough to challenge them and so our body reflects the submissive to their dominant language. HEARD THE SAYING FAKE IT UNTIL YOU MAKE IT? 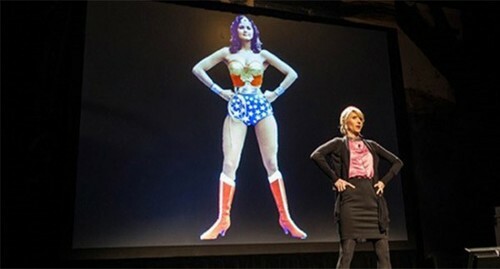 However, the way Amy Cuddy sees it fake it and you will become it. Amy has in fact studied this theory in much detail and the results proved the theory true, but how? How could standing in powerful poses really help you to be more powerful? ACTING POWERFUL CAN MAKE YOU LESS STRESSED! Cuddy experimented by recording hormone levels in patients and then asked them to hold one of two poses for a few minutes, those who posed in the power poses released more testosterone and less cortisol and felt more powerful and confident. Those that held the submissive pose lowered their testosterone levels and increased their cortisol, feeling less powerful. She links this to the fact that in the wild, male species are more dominant and would have higher testosterone levels; an ape leading a pack would have higher testosterone levels than the other males. Additional to this, if the pack leader dies and another ape must step up and become the pack leader, their testosterone levels will increase almost immediately. Perhaps, if you are feeling that you do not receive enough respect from others, perhaps you would like to command more authority in your job or maybe would simply like to come across as more authoritative, start by working on your body and then your brain will believe it. By the time you believe it, you have become it. Try your wonder woman or superman for that matter, no-one need know. If you find yourself slouching and nodding in submission, stand up straight, hold your head high and get engaged with people. You will help your body and mind feel more in control and decrease stress as a result and see for yourself that your body language could change your career.